A MAN has been treated in hospital after being attacked in the early hours of the morning. 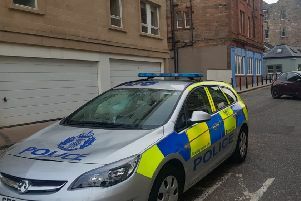 The 25-year-old suffered a head injury when he was assaulted by two men in Buccleuch Street, Dalkeith, at around 2.20am. Police are now hunting two suspects, both described as white, of medium build, with short dark hair. One of the men was wearing a red long-sleeved top with blue jeans. The other was wearing a white long-sleeved top with light blue jeans.